Sunday 13th December - Alders Farm Milton Keynes. Final round of winter league. Team Colmic! I drew peg 31 on pines, next peg to where I was last round 2 weeks ago, right in the corner! 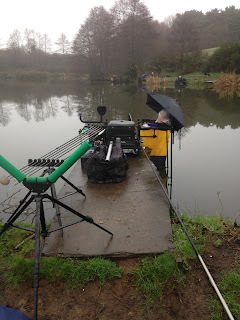 With this in mind decided to fish it similar to last time with an out and out pole approach, as you only have about 18m of water until you enter next peg! Started off short feeding and fishing pellets and foul hooked one first drop in that I lost. 20 minutes passed and I felt this line wasn't going to produce so shipped out to 13m again fishing a feeding pellets. I started of cad potting on this line but I felt it wasn't right so started pinging and had an instant response. The float buried and I was into my first fish. A tench! Which wasn't a very good sign! After sorting out the feeding began to catch a few on this line and had to follow them out to 14.5m. Finished with 13 fish for 32-0-0. Putting me 5th in my section. On the team front, Chris telling won his section and the match with 115-0-0 What a hero! Glen Picton had 64 lb for 5th in section. Frank Donachie had 40 lb for 5th in section. on the day and more importantly we finished 2nd overall! Happy with that! Thursday 24th December - Manor Farm leisure open.